The industrial and technology communities came together this year to support Mechanical Mayhem, the Milford Area Homeschoolers FIRST Robotics team. GMFCo was delighted to sponsor the local team that made it all the way to the national quarterfinals in St. Louis in April. Mechanical Mayhem qualified for the Nationals with an impressive 3rd place ranking out of 194 New England teams competing. FIRST Robotics, started by science & technology visionary Dean Kamen of DEKA Research, teaches middle and high school students some of the wonders of engineering. Beyond that, the kids experience how to apply scientific, technological and mechanical principles in real, fun and exciting ways. This fun program has fostered curiosity and interest in STEM and mechanical work like no other that we’re aware of. As a result, the economy benefits from a renewed interest among young people in designing and building useful things. The Manufacturing, Engineering and Construction sectors of our economy are starving for educated, trained and skilled workers. We’re literally screaming for young, creative, motivated talent to fill the growing roles in management, operations, technical and field work. FIRST Robotics gets students deeply involved, not only in the design and technology aspect of building robots, but they must work with their hands in diverse ways. These kids get applied exposure to computer programming as well as a wide variety of components manufacturing and assembly. They deal with metal fabricating, machining, plastics, electronic circuitry, wiring and more. Students also learn the importance of honorable competition as well as collaborating and forming winning alliances. You can see it in their eyes. 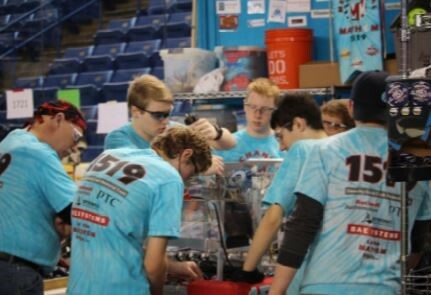 All members of the Mechanical Mayhem team could hardly contain their excitement, not only during the competitive events but every time they showed up to work on their robot. Some of them can’t wait to take their new engineering knowledge to the next level. New Hampshire is fortunate to have a man like Dean Kamen who is willing to commit significant personal and business resources toward advancing interest in STEM and mechanical careers. New England is also fortunate to have numerous engineering schools and technical colleges but we need to seriously confront the continued lack of interest in technical and manufacturing careers and this starts as early as elementary school. We’ll continue to sponsor and support local initiatives that promote STEM and mechanical learning. If we fail to lay the foundations for our children’s future, who will? Who should? Gilchrist Metal Fabricating Company was recognized for outstanding work on projects by Bechtel’s Nuclear, Security & Environmental global business unit at the Bechtel Supply Chain Recognition awards. The awards recognize subcontractors and suppliers who supported Bechtel‘s work in nuclear power, environmental clean-up, defense, and nuclear security and operations projects during 2016. Companies were evaluated on multiple factors. They include: overall performance; the ability to deliver quality services/supplies on time; the ability to work collaboratively to meet milestones; and meeting or exceeding project expectations in aspects of safety, construction performance, technical expertise, and environmental compliance. Nominations were reviewed and approved by Bechtel procurement and project managers. Final recommendations were approved by senior leadership. Gilchrist Metal Fabricating Company (GMFCO) is a family owned and operated business, dedicated to providing precision metal fabrication and machining for industries ranging from aerospace & defense to nuclear power, alternative energy, and many more. Founded in 1975, GMFCO has maintained a constant focus on offering the best available capabilities in its 70,000sq. ft facility located in Hudson, NH. Infrastructure; Nuclear, Security & Environmental; Oil, Gas & Chemicals; and Mining & Metals. Our company and our culture are built on more than a century of leadership and a relentless adherence to our values, the core of which are safety, quality, ethics, and integrity. These values are what we believe, what we expect, what we deliver, and what we live.